Do You Know You’re Unworthily Worthy? It was an easy thing to do since we are on vacation. Spending a few minutes with him looking at the tide pools and talking about the different birds we saw reminded me of how simple it is to love. Spending time together alone is great way of showing him that I love him, and that I like to be with him. I think children are vastly better than grown ups are at accepting love. Adults seem to wonder if we are worthy of the love offered. We bring our baggage to each new relationship and let those past experiences taint our new connections. We hoard our sins, big and little, and sometimes even hold onto the sins forgiven in the confessional. Of course, God’s love is different than our perception of love. It is unconditional. When I converted to the faith a dozen years ago my biggest concern was that I was not worthy of the Eucharist. Yet children, in their innocence and optimism, are sponges, soaking up the love from both those in Heaven and this world. His unconditional love empowers us to follow His teachings and to act in accordance with His law. 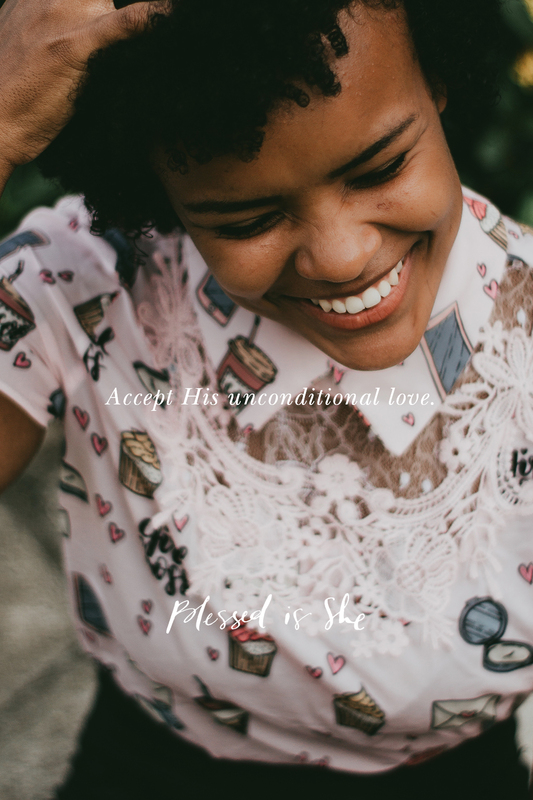 If we fail to accept His love, we fail to fully receive the grace required to make the tough choices. We become defensive and even aggressive in light of difficult teachings. We parse words and look for justification for our actions. We make excuses. Jesus gives us very difficult but simple instructions in today’s Gospel (Mark 10:2-16). The children came up to just be with Jesus. They didn’t want to challenge Him on the divorce discourse He had just given. The children’s parents just wanted their children to be blessed, to be in His presence. Can you come to God as a child sometime this week? Let’s strive to stay quiet, leave our demands and arguments and disappointments aside. Let us simply accept His unconditional love. If unconditional love is something you’re struggling to receive from God, pray the centurion’s prayer we say at Mass many times a day (Matthew 8:8). See how it moves and shapes you. Dr. MaryRuth Hackett is Director of Operations for Blessed is She and host of the podcast Parenting Smarts. She loves historical fiction, dark chocolate, watching her children play soccer, a good cup of coffee (decaf please) and the quiet of the early morning. She holds a PhD in Educational Psychology and has a passion for helping parents understand the way their children grow and develop. You can find out more about her here. She is the author of our Blessed Conversations: Leader Guide found here. Previous Post Did You Feel Delivered?